The new season starts at Sale and we have three runners in Lady Loft, Outback Warrior and Potemkin. Lady Loft is the first to go in race three, the Maiden Plate over 1422m with Patrick Moloney to ride. The daughter of the Roman Emperor is fully fit after six runs this preparation and Moroney is expecting a better showing on softer ground. “She’s drawn nicely here and if she shows her usual speed then she should be able to put herself right on the speed,” Moroney said. Outback Warrior runs in race six, the Benchmark 64 Handicap over 1013m with James Winks to ride. “The scratchings have helped and he’ll jump from barrier three which is a help,” Moroney said. “There are some seasoned horses dropping back in grade in the race so it will not be easy. “He did disappoint us in town last start after his impressive debut win but he is starting to learn to relax in his work and his attitude is a lot more relaxed. 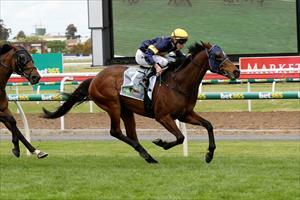 Potemkin (pictured) runs in race seven, the Benchmark70 Handicap over 1739m with Stephen Brown claiming. Potemkin disappointed last start after a solid win at Ballarat, however Moroney explained the firm track at Sandown was the reason. “The soft track here will suit and he’s drawn nicely in an even field,” Moroney said. “He’s worked well and the key to him will be the ground - he will be much better on the softer surface here.